The Wonder Hounds slot from Next Gen was released in December 2017. The video slots has 3 rows, 5 reels and 25 paylines. The games theme is in an idyllic forest in the autumn time and the reels and symbols run in a wooden frame. As usual, the Pokerkarten symbols are also low-valued on the Wonder Hounds slot. In contrast, all dog symbols have higher payouts. There is the detective dog Winchester, the pilot dog Ace or the little Japanese fighter Jinse. In addition, there is a bone symbol, a dog bowl and of course a wild symbol. This replaces all other symbols except the Dog Paw Scatter Symbol. Bonus Feature Wonder Hounds Gone Wild: Already in the base game you can clear big profits at the Wonder Houns Slot. The minimum bet is £ 0.25 and you can bet up to £ 250 per spin. When the “Wonder Hounds” appear, you are already winning handsome prizes. It will be even more exciting with the Wonder Hounds Bonus Features! The Gone Wild feature is randomly triggered in the base game. The dogs then turn into wild symbols and improve your profits considerably. Wonder Hounds Slot Free Spins Feature: But it gets even more interesting when three or more dog paws start the Free Spins feature on the Wonder Houns slot. Your big advantage is then that you can play for free, but also that you get multiplier winnings! When the Wonder Hounds Slot Free Spins feature starts, you get up to 15 sticky wild symbols. This means the wild symbols remain the entire free spin round on the reels. You can imagine what winnings are possible with a 100x multiplier! If you do not get the maximum number of sticky wilds, you can get additional wilds during the free spins. 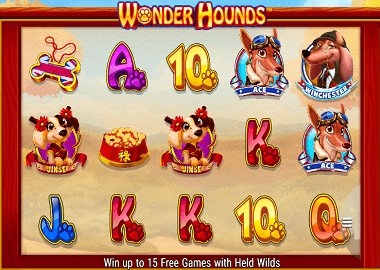 Of course you can play the Wonder Hounds slot here as long as you want (simply click on the slot above) – no registration and no deposit as usual. You can also find more free slots here. Wonder Hounds has an RTP (Return to Player) of more than 95%. From a technical point of view, the game is outstanding – Next Gen has developed a wonderful slot. You can play the Wonder Hounds on your computer as well as Smart Phones or Tablets. In the online casinos below you will find the slot for playing with real money.